Coming out of World War II, the United States leaped into a post-war boom that changed the entire landscape. People starting moving out of the cities with dreams of home ownership and more land in the 1950s. The rise of the automobile (and the subsequent demise of public transportation) spread out metropolitan areas and segregated people by race and class. A prime example is my hometown of St. Louis, which was one of the country's top cities. The population fell dramatically and shifted away from downtown, creating an eerie divide that remains today. During the next three weeks, I'm checking out three documentaries that delve into the difficulties of cities and raise questions about society's future. 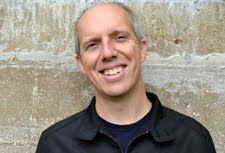 The first selection is Chad Freidrich's The Pruitt-Igoe Myth, which explores the demise of a once-promising government housing project in St. Louis. Using this example, he raises tough issues that are still being faced in the 21st century. 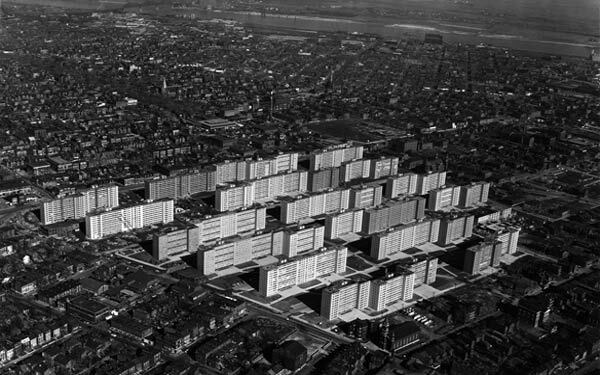 The Pruitt-Igoe public housing development was constructed in 1954 with hopes of solving problems in the St. Louis inner city. The massive complex included 33 buildings that were each 11 stories tall. Although it was an idealistic venture, Pruitt-Igoe fell into disrepair and became symbolic of failed government housing. This documentary covers the optimistic beginnings and the reasons for why this development fell. We also hear from people who lived in these buildings and have positive feelings about them. When demolition began in 1972, they lost a part of their childhood, even if the memories were painful. Using archival footage and these conversations, Fredrichs paints an intriguing picture of a city in decline. One of the key factors in the demise of Pruitt-Igoe was the unfortunate set-up for financing the project. Maintenance was funded entirely from monthly rent and not from government money. In prosperous times for St. Louis, this would have allowed the buildings to retain their original standards. Unfortunately, the dramatic rise of the suburbs decimated the once-burgeoning downtown area. 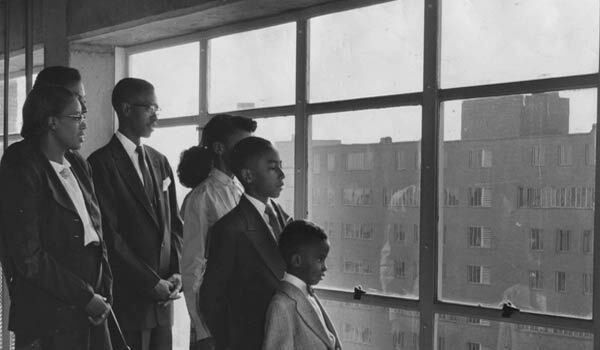 Jason Henry's narration clearly outlines how this "white flight" played a major part in Pruitt-Igoe's fall from grace. Within a few years, basic services like heating and sanitation declined, which changed the entire tenor of the site. It's distressing to hear about the awful conditions that arose, and it makes the ensuing problems understandable. By hearing directly from residents, we get a more complete picture of the potential success and ultimate failure of the ambitious project. What makes The Pruitt-Igoe Myth feel even more significant is the fact that St. Louis remains divided. There has been some revitalization to the downtown area, but people continue to move farther outside the city. I live just beyond the city limits, and that's practically the inner city to many residents. It's interesting that Pruitt-Igoe was set up to be a cross-cultural location but ended up segregating the population. It's clear that racism was a key factor in the negative outlook towards these tenants that helped to destroy these buildings. It's a telling example of a divided city that has connections to experiences in Baltimore, Detroit, and many other metropolitan areas. 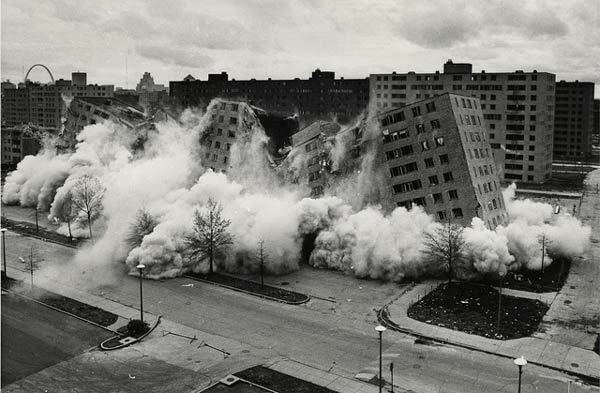 Instead of showing how far we've come, the failures of Pruitt-Igoe reveal an ugly side that remains today. The tenant interviews dominate the time and give a human side to what could become a dry history. Instead, we get emotional responses from people who lived through the decline. An early conversation with Sylvester Brown covers his recent visit to the abandoned site where the buildings stood. It's hard to imagine the experience of seeing your childhood home turned to rubble. An even more distressing story has a fairly young guy recounting the shooting death of his nine-year-old brother. It's hard to come to terms with such a tragic moment, particularly when described so vividly. I also enjoyed hearing glowing praise from a woman who looks back fondly on her time there. This shows the promise that existed in Pruitt-Igoe for low-income families. They were thrilled by the opportunity but didn't realize that poor planning set them up for disaster. This movie works because of its subject matter, and Freidrichs does a good job keeping our interest. This isn't one of those world-changing movies with a unique style, but the impact has remained with me. The main reasons are images of disrepair combined with the residents' stories. There are a few jarring transitions from the interviews (shot in front of a white screen) to the next topic, but it's only a minor issue. Even if you aren't interested in urban development, this documentary still has plenty to offer. I grew up in St. Louis and live there, so that connection made it an even better experience. Next week, I'll head to Chicago and hit the streets with The Interrupters.